THE SAPPHIRE COAST SCIENCE FESTIVAL IS BACK!! The Sapphire Coast Regional Science Hub, with the generous support of Inspiring Australia (NSW), is excited to present Questacon’s Fascinating Science exhibition at the Bega Valley Commemorative Civic Centre; a great opportunity for people of all ages to have engaging, fun science experiences. The festival will also feature a great range of science activities including: Virtual Reality installation and robotics, music technology, 3D printing, science displays, environmental displays, threatened species information, citizen science, marine science and science movies! 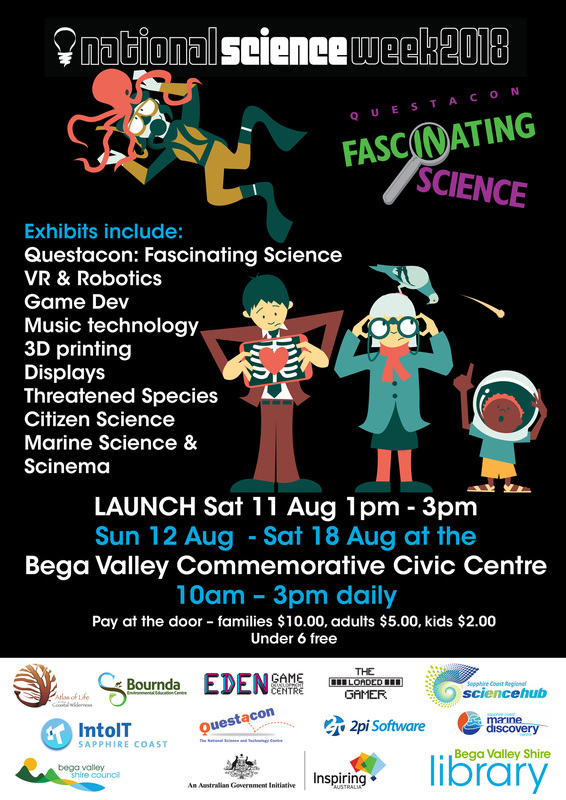 IT’S A SCIENCE EXTRAVAGANZA…….IN BEGA! This is a wonderful opportunity to find out how local organisations are creating dynamic science engagement activities for the whole community. If you are interested in science, technology, the environment and sustainability – this is the place to be. The exhibition will be open to the public at the following times with an entry fee of: $10 for families; $5 for adults; $2 per child (age 6 to 18); Children under 6 free. Saturday 18th August – 10:00am – 3:00pm and Festival closing. School bookings are no longer available – all sessions have filled. Please indicate your preferred date and time for the session you wish to attend. The exhibition will be open all week from Monday, 13th August to Friday, 17th August. The exhibition can accept up to 100 students per session. It will be staffed by volunteers and students must be under the supervision of teachers during the activities. Now entering its fifteenth year, National Science Week has well and truly cemented itself as Australia’s largest festival, with last year’s calendar offering over 1000 events throughout Australia, reaching an audience of over a million people. In 2018, National Science Week events are expected to be held right throughout Australia from Dubbo, Davenport, Darwin and everywhere in between, offering an array of activities with everything from science festivals, music and comedy shows, interactive hands-on displays, open days and online activities.The festival is proudly supported by the Australian Government, as well as partners CSIRO, Australian Science Teachers Association and the ABC.